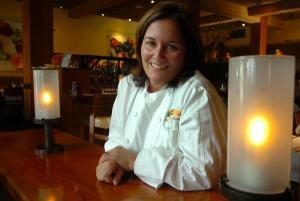 Successful restaurateur Heidi Krahling, 13 year+ owner of Mediterranean Cuisine restaurant Insalata’s located at 120 Sir Francis Drake Blvd in San Anselmo, has duplicated her formula for success and opened up yet another successful restaurant, called Marinitas. Nicknamed Latin Lusciousness by its devoted crowd, it has captured the imagination of the younger restaurant goers in Marin County just a couple doors down from sister restaurant, Insalata’s. There, the younger crowds party into the night. This , as contrasted by Insalata’s more demure clientele, ones who would never use Facebook, but would buy with undying enthusiasm, her first cookbook, called Insalata’s. (Available at www.insalatas.com ) Hailing from an Italian background, would-be home cooks would do well to own this gourmet recipes book and get a wealth of ideas for cooking for the Mediterranean table. I love the fact that 8 years after we photographed Porcini Rubbed New York Steak with Carmelized Shallots, Hen of the Woods Mushrooms and Picholine Salsa Verden in Heidi’s restaurant, I find the same recipe in her cookbook, only this time with the added information that the recipe for the rub was inspired by that wonderful Italian Chef Mario Batali. This recipe can now be found by Heidi in the first edition of World’s Most Beautiful Recipes , along with her recipe of Grilled Pork Loin With Bulgur Pilaf and Honeyed Figs.